Guest post by Judy about holidays after our review-which includes a recipe for the holiday celebrations! Details on how to win a copy of this book in either print, ebook, or audio, at the end of the review & a link to purchase it in audiobook form. 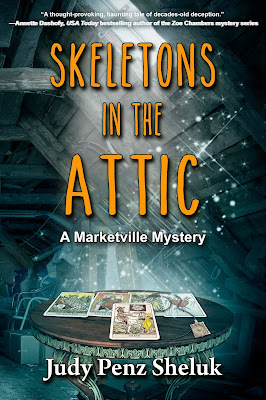 Skeletons in the Attic earns 5/5 Trunks of Hidden Memories…and Mysteries! Judy Penz Sheluk’s story introduces Calamity ‘Callie’ Barnstable as she deals with a shocking dilemma. After her father’s “unfortunate occupational accident,” she learns she has inherited his entire estate including his Marketville house of which she has no memory. The dilemma is the codicil which requires Callie live in and renovate the house, and after one year, she can do with the property what she wants: rent, sell, or take up permanent residence. The shocking part of the dilemma is the reason her father made this stipulation: find out who murdered her mother. Murdered? Now it really gets good. 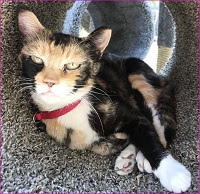 For thirty years Callie was led to believe she and her father had been abandoned. However, her father’s interest in what had happened to his wife had been reignited by the last renter, psychic Misty Rivers, who says the house is haunted by a former resident who loved lilacs. Lilacs, the only thing that would grow on the property, had been originally planted by her mother, Abigail. Her father surmised his wife must have been murdered and had intended to investigate himself, but his untimely “accident” stopped that. It is now up to Callie to uncover the truth. She heads off to her new residence with a new purpose in life uncovering family photos, an envelope of a curious set of tarot cards, a piece of jewelry, and in her father’s safety deposit box newspaper clippings all posing new questions and feeding her suspicions…several things are not what they seem. I was thrilled to have joined in on this reading adventure last year penned by Judy Penz Sheluk, and in the process, gaining a Facebook buddy with whom I have also worked as a beta reader on a couple of exciting projects. This mystery, first in her Marketville Mystery, was engaging, the characters endearing, the twists and turns and cliffhanger-style ending made me wanting more. 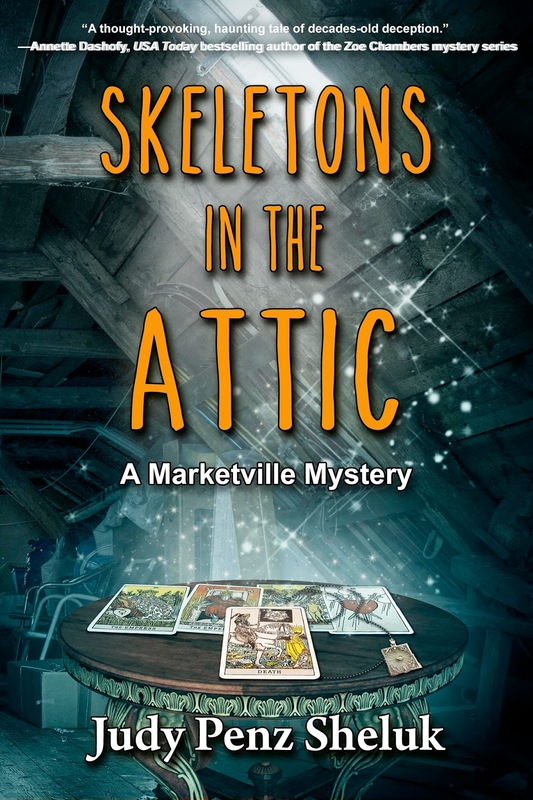 So when Judy announced “Skeletons in the Attic” was being re-released with Barking Rain Press, I was eager to help once again get the word out, especially when I was lucky enough to get a copy of the audio version…so, off to listen I go! The mystery surrounding Callie’s mother is very intriguing with curious clues, suspicious behaviors, and a cliffhanger-style ending, but I was delighted to find the story was more character driven than an action-packed investigation. I found myself more invested in the friendships Callie makes, her memories of her parents, family with whom she connects, and the hunk next door. Judy provided wonderful characters who acted and reacted in real ways, wrote well the conversations and descriptions to keep me turning the page, and had me guessing about who, what, and why. I was fascinated by the ‘tarot cards’ clue leading me to Google and exploring my own set. Then add the talented and pleasing, yet traditional, narration of Claira Jordyn and my interest has been renewed. Claira’s traditional interpretation is extremely entertaining and closer to how many stories are read out loud at libraries or author meet & greets. In many ways I find that to be preferable. She foregoes changing her voice in an obvious manner for male and female characters that some narrators have a difficult time mastering. A woman doing a male’s voice doesn’t always work. Instead Claira uses a very pleasant voice, tone, and emotion to illustrate the tenor of the story or a character’s personality. I perceived the narration to be Callie. Callie herself, reading to me, sharing her own story, and taking me on her delightful ride. It was excellent, and I highly recommend this audiobook. Here is a fun bit from Judy’s website “Food & Drink”! Be a Big Judy Penz Sheluk Fan! 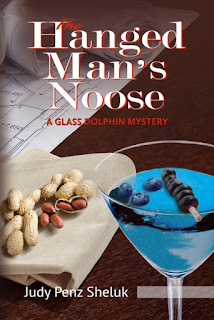 Judy writes the Glass Dolphin Mystery series published in 2015 beginning with the very entertaining The Hanged Man's Noose. 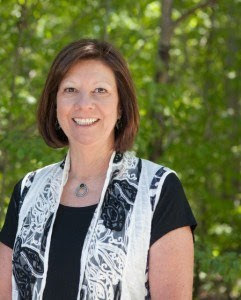 Emily Garland, a free-lance journalist, is sent to Lount’s Landing and begins investigating a new commercial project that is slowly building up opposition by the local businesses and residents. Real estate mogul Garrett Stonehaven is determined to turn an old school into a mega-box store, but the locals, including very vocal Arabella Carpenter, object, wanting to preserve the quaint character of the town. That’s not going to stop him…well, maybe murder will. This story may be complicated, but it is very engaging and highly recommended. It is going to be released as an audiobook in December 2017, and the second book in this series, A Hole in One, is expected to be released in March 2018. Canadian Thanksgiving is celebrated on the second Monday of October, which is Columbus Day in the U.S. Unlike American Thanksgiving, which seems to be much more of a huge deal, Canadians celebrate much more quietly, of course the same could be true for our Canada Day—July 1 vs. July 4. However, Thanksgiving is very much a family time, with the usual type of food—turkey, mashed potatoes, pumpkin pie, etc. It is a statutory holiday. My husband and I got married twenty-eight years ago on October 13, which usually ties in with Thanksgiving weekend, so we usually celebrate by going away for the weekend or spending the time alone together at our place on Lake Superior. We’re both solitary sorts—to put that in perspective, we had about less than 20 people at our wedding, all immediate family and a couple of really close friends. In Canada, Christmas and the holiday season is much more of a celebration than Thanksgiving, regardless of religious beliefs. The following day, December 26, is Boxing Day, similar to your Black Friday, with the malls open and the clearance sales on steroids. Since both days are stat holidays, those of us trying to make both sides of our collective families happy tend to eat two Christmas dinners (turkey, cranberry sauce, etc), once on Christmas and once on Boxing Day. And if we have more sides (i.e. divorced parents), there’s a brunch involved on both days. This is not a time to be on Weight Watchers! Anyone who has any sort of “say” in the matter will take the week off work between Christmas and New Years. Offices work on skeleton staffs or close down altogether, and after Boxing Day, retail stores tend to be quiet. That week is very much family time. Kids are off school, folks are doing day trips, skiing, skating, hanging out, visiting friends and other family that may live out of town. More food, usually leftover turkey, and too many cookies and chocolate. My mom is Anneliese, and this is her recipe for almond crescents. The best shortbread you’d ever want to eat. She made them every Christmas, and it was a definite tradition in the Penz household. I’m not much of a baker, so I really miss having these. I dedicated “Skeletons in the Attic” to my dad, and he LOVED these cookies, too. They are amazing. Mix together butter with sugar and beat with a mixed until light and fluffy. Add vanilla extract and almond extract and continue to beat until incorporated. Stir in the flour and almonds. Work flour mixture into a firm dough. Working with 1 tablespoon of dough at a time, shape into logs. The log should be slightly thicker in the middle than at both ends. Bend into a crescent shape. Place on greased cookie sheets. 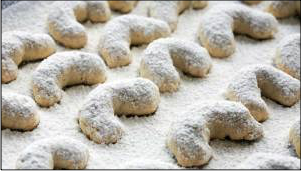 While the cookies are still warm sift crescents with powdered sugar. Like, Visit, and Follow…oh, my! To enter to win either a print, ebook, or audiobook copy of Skeletons in the Attic simply email KRL at krlcontests@gmail[dot]com by replacing the [dot] with a period, and with the subject line “forgeries,” or comment on this article. A winner will be chosen November 25, 2017. U.S. residents only. If entering via email please included your mailing address and either way be sure to note whether you want ebook, print, and audiobook. Fans of cozy mysteries, audiobooks, and Judy Sheluk will be the winners with this giveaway. Great story and characters, hands-free (LOL) entertainment, enjoyable narration, recipes for you holiday gatherings, and an author you'll be off to explore and 'Like.' Thanks, Judy! Thanks so much for this wonderful review! This is a new series of me. I really liked the description of the book and I would enjoy reading it. Thanks for the chance. This is a new author to me but I love the information you told us about both her and her wonderful mystery book Skeletons in the Attic. I would LOVE to be the fortunate one to receive a print copy of this book. Thanks for the chance!